We’ve all experienced that magical feeling of being hit with ‘a brainwave’. That moment of newfound clarity, shift in perspective or a novel idea. And typically, it seems to appear out of nowhere. In between sips of coffee, while out for a walk, or simply indulging your dog in a good belly rub. While “a brainwave” can be a figure of speech to describe our thoughts, scientists and clinicians can use literal brainwaves, measured on the head, to help understand the functioning of the human brain. As it turns out, the key to having more of these ‘aha’ moments lies in understanding the science behind brainwaves. Neuroscientists have been studying brainwaves – the popular name for the field of electroencephalography – for nearly a century. The brain has billions of neurons, and each individual neuron connects (on average) to thousands of others. Communication happens between them through small electrical currents that travel along the neurons and throughout enormous networks of brain circuits. When all these neurons are activated they produce electrical pulses – visualize a wave rippling through the crowd at a sports arena – this synchronized electrical activity results in a “brainwave”. One way that EEG ‘brainwaves’ convey information is in their rate of repetition. Some oscillations, measured on the scalp, occur at more than 30 cycles per second (and up to 100 cycles per second!) These cycles, also called frequencies, are measured as Hz, or hertz, after the scientist who proved the existence of electromagnetic waves. When looked at this way, brainwaves come in five flavours, each of which corresponds to a Greek letter. As we’ll see, these different brainwaves correspond to different states of thought or experience. While there are many other ways to analyze brainwaves, many practitioners of a field called neurofeedback rely on dividing brain oscillations into these five categories. Some of these brain oscillations are more easily detectable on specific parts of the scalp, corresponding to the parts of the brain just below. The brain has many specialized regions which correspond to different processes, thoughts, and sensations. Particular oscillations often reflect distinct regions and networks in the brain communicating with each other. Different patterns of brainwaves can be recognized by their amplitudes and frequencies. Brainwaves can then be categorized based on their level of activity or frequency. It’s important to remember, though, that brainwaves are not the source or the cause of brain states, or of our experiences of our own minds – they’re just some of the detectable reflections of the complex processes in the brain that produce our experience of being, thinking, and perceiving. Slow activity refers to a lower frequency and high amplitude (the distance between two peaks of a wave). These oscillations are often much larger in amplitude (wave depth). Think: low, the deep beat of a drum. Fast activity refers to a higher frequency and often smaller amplitude. Think: high pitched flute. Below are five often-described brainwaves, from fastest activity levels to slowest. Gamma brainwaves are the fastest measurable EEG brainwaves, and have been equated to ‘heightened perception’, or a ‘peak mental state’ when there is simultaneous processing of information from different parts of the brain. Gamma brainwaves have been observed to be much stronger and more regularly observed in very long-term meditators including Buddhist Monks. Beta brainwaves are easiest to detect when we’re busy thinking actively. These are the slowest of all brainwaves, and are strongest when we are enjoying restorative sleep in a dreamless state. This is also the state where healing and rejuvenation are stimulated, which is why it’s so crucial to get enough sleep each night. Is it possible to change how much we experience these different brainwaves, and the brain states and thought experiences associated with them? In short, yes. For decades, practitioners have engaged in training programs which are intended to reinforce the brain states which produce increases in certain brain oscillations, and decreases in others. The most common example of this, called neurofeedback, can utilize EEG or other brain sensing modalities. Neurofeedback practitioners and clinicians find that immediate, direct feedback on brain states, whether in the form of sound, light, or even a video game, can produce changes in underlying behaviors and brain states that are reflected in brainwaves. This feedback seems to accelerate the learning process, by making brain states more apparent to the recipient. Another important discovery in the recent history of neuroscience is the significant differences in brainwave characteristics of highly experienced meditators. Expert meditators not only have different resting-state brainwaves from non-meditators – they also seem able to control their brainwaves through voluntary thought control with greater ease than others. So how do we start to improve our ability to control our brainwaves? These brainwave-changing skills can be learned. Meditation deepens your ability to focus and control your attention. Muse has been tested and validated against EEG systems that are exponentially more expensive, and it’s used by neuroscientists around the world in real-world neuroscience research inside and outside the lab. 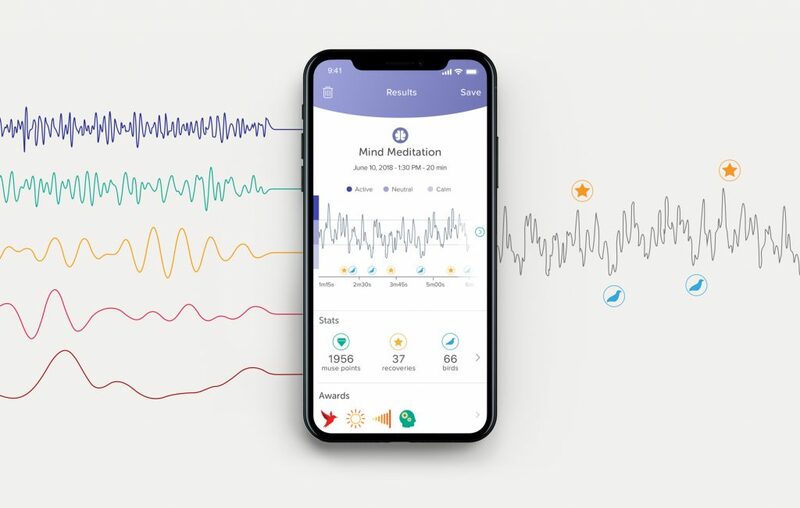 Using 7 finely calibrated sensors – 2 on the forehead, 2 behind the ears plus 3 reference sensors – Muse is a next-generation, state of the art EEG system that uses advanced algorithms to train beginner and intermediate meditators at controlling their focus. It teaches users how to manipulate their brain states and how to change the characteristics of their brains. The Muse algorithm technology is more complex than traditional neurofeedback. 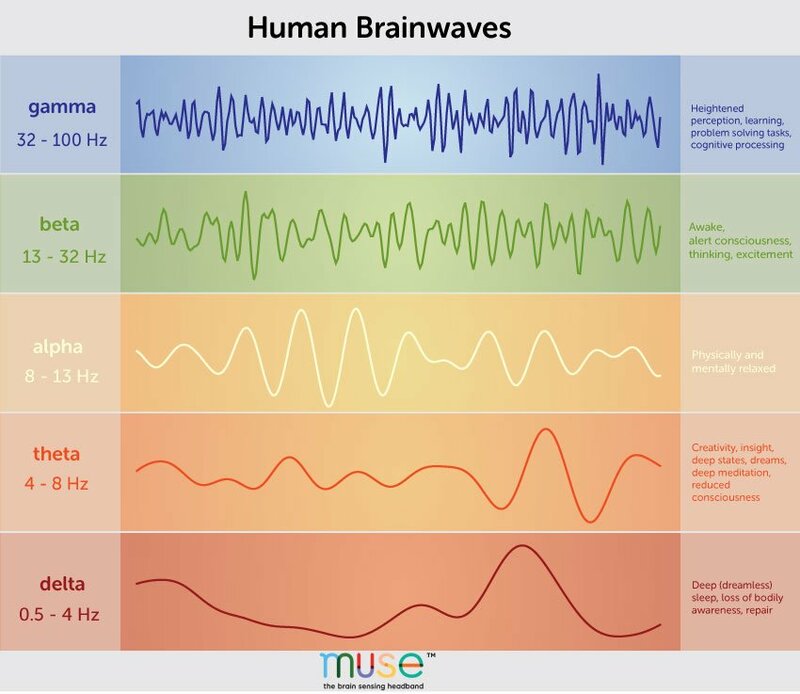 In creating the Muse app, we started from these brainwaves and then spent years doing intensive research on higher-order combinations of primary, secondary and tertiary characteristics of raw EEG data and how they interact with focused-attention meditation. It’s important to note that a lot of people confuse what the Muse app measures with traditional neurofeedback (which focuses on training individual frequencies), but it doesn’t map individual frequencies – it uses a unique and complex combination of the various brainwaves in order to provide results such as calm, active, and neutral states. If you are interested in measuring individual band powers the Muse headband can be used in combination with Muse Direct for iOS to perform individual brainwave monitoring and recording for more traditional neurofeedback, research projects, art installations, and more! Scientific American. (2018). What is the function of the various brainwaves?. [online] Available at: https://www.scientificamerican.com/article/what-is-the-function-of-t-1997-12-22/ [Accessed 26 Feb. 2018]. Lustenberger, C., Boyle, M., Foulser, A., Mellin, J. and Fröhlich, F. (2015). Functional role of frontal alpha oscillations in creativity. Cortex, [online] 67, pp.74-82. Available at: https://www.sciencedirect.com/science/article/pii/S0010945215001033 [Accessed 26 Feb. 2018]. ScienceDaily. (2018). Alpha waves close your mind for distraction, but not continuously, research suggests. [online] Available at: https://www.sciencedaily.com/releases/2012/10/121008134058.htm [Accessed 26 Feb. 2018]. Haarmann, H., George, T., Smaliy, A. and Dien, J. (2012). Remote Associates Test and Alpha Brain Waves. The Journal of Problem Solving, [online] 4(2). Available at: https://docs.lib.purdue.edu/jps/vol4/iss2/5/ [Accessed 26 Feb. 2018]. Buzsáki, G. (2002). Theta Oscillations in the Hippocampus. Neuron, [online] 33(3), pp.325-340. Available at: https://www.sciencedirect.com/science/article/pii/S089662730200586X [Accessed 26 Feb. 2018]. White, N. (1999). Theories of the Effectiveness of Alpha-Theta Training for Multiple Disorders. Introduction to Quantitative EEG and Neurofeedback. pp 341-367. Available at: https://www.sciencedirect.com/science/article/pii/B9780122437908500146 [Accessed 26 Feb. 2018]. Brainworksneurotherapy.com. (2018). What are Brainwaves? Types of Brain waves | EEG sensor and brain wave – UK. [online] Available at: http://www.brainworksneurotherapy.com/what-are-brainwaves [Accessed 26 Feb. 2018]. Calomeni, Mauricio Rocha, et al. “Modulatory Effect of Association of Brain Stimulation by Light and Binaural Beats in Specific Brain Waves.” Clinical Practice & Epidemiology in Mental Health, benthamopen.com/FULLTEXT/CPEMH-13-134.